From 6 to 13 April 2019, students of the College of Europe Natolin campus embarked upon one of five tailor-made second semester study trips to different destinations within the European Union and at its borders. The study trips are an integral part of the academic programme of the Department of European Interdisciplinary Studies. To learn more about the different destinations and topics of the previous study trips organized for Natolin students, click here. This year's second semester study trips included 12 countries: Tunisia, Georgia, Armenia, Lithuania, Latvia, Estonia, Finland, Croatia, Serbia, Bosnia and Herzegovina and Belgium and Luxembourg. Discover the places Natolin students visited in the photo gallery and learn more about each study trip in the descriptions below. 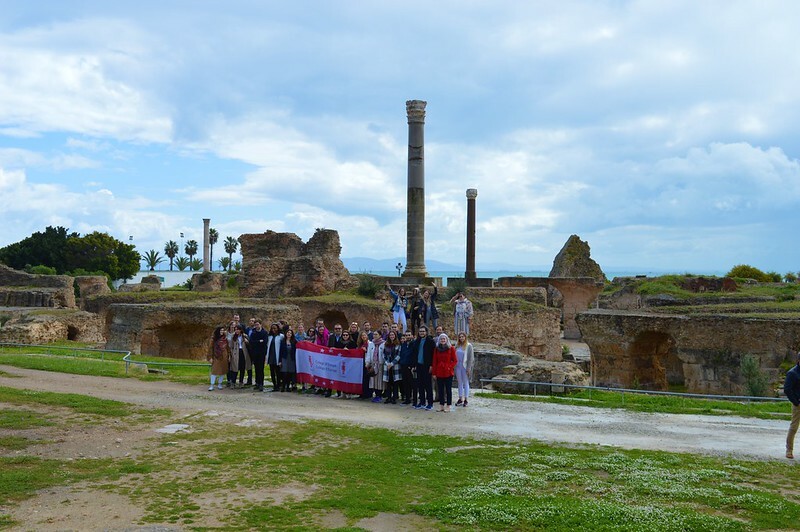 This year the College of Europe in Natolin decided to offer its students the opportunity to discover Tunisia. The post-revolution socio-political developments and challenges in Tunisia exposed students to a unique experience into the life of a country undergoing a genuine democratising process, despite daunting challenges lying ahead. The study trip offered an authentic experience and understanding of a vibrant postrevolution social and political environment. Meeting and discussing with actors involved in transitional justice, reconciliation processes, economic reforms, conflict resolution, human rights observance, migration matters, press freedom, gender, education and cultural affairs in a post-revolution context gave participants, faculty and students, an eye-opening insight and understanding of current Tunisian political affairs. In addition to the rich academic programme, students had the opportunity to discover an impressive historical and cultural heritage of the country. "The Rocky Road to Europe: Reconciliation, Reforms and Regional Cooperation in the Western Balkans"
The geopolitical and strategic importance of the Western Balkans cannot be overestimated, especially in the next EU enlargement perspective. Additionally, the governments in this region are trying hard to reform and improve their political and social outlooks, but are held back by legacies of war, corruption, ethnic tensions and external pressure, i.a. caused by the refugee and migration crisis. A solution to those problems proposed by the EU is the Berlin Process. This is an intergovernmental cooperation initiative aimed at revitalizing the multilateral ties between the Western Balkans and selected EU member states, and at improving regional cooperation on the issues of infrastructural and economic development. The Western Balkans include some of the EU’s closest neighbours and could, given their turbulent history and a lukewarm intervention within a destructive civil war, be seen as the EU’s conscience as well. The region has been deeply influenced by the refugee and migration crisis. Those countries are also a good indicator of how powerful the EU’s soft power really is – can the EU successfully attract some of its closest neighbours? Is the Berlin Process going to lead to enlargement of the European Union, incorporating more countries of the region? It is one thing to read about the Balkans and quite another to see the region in person. A trip through Croatia, Serbia and Bosnia&Herzegovina showed how the social, ethnic, and political landscape transforms just as the physical geography of the countries changes. The second semester study trip to Georgia and Armenia revolved primarily around the themes of regional and national security. In this context, the trip will also examine the current socio-political situation in both countries. Lastly, the visit provided an excellent opportunity for exploring distinct and ancient cultural heritage of both states. Remarkably, in spite of geographical proximity, the two states have opted for starkly divergent foreign policy orientations, which stem in part from and reinforce further their domestic governance systems. Ever since the Rose Revolution in November 2003 and despite Russian Federation’s transgression against its sovereignty in 2008, Georgia has resolutely pursued a policy of establishing closer ties with NATO and the EU. Since 2003, successive governments have been eager to cooperate with Western institutions to transition towards democracy and develop its economy. A lengthy and uneasy process of implementing reforms led to impressive results in combatting corruption and a notable move towards a free-market economic system. This effort has been recognized by, among other institutions, the European Union, which entered into an Association Agreement with Georgia in 2016 and granted Georgians visa-free travel into the Schengen Area. Despite this progress, signs of stagnation abound while popular expectations for higher standards of living mount. The EU has avoided offering Georgia a much-desired prospect of membership, but can it still help spur the substantial economic growth needed to meet such expectations? Meanwhile, Georgia’s lingering conflict with Russia over South Ossetia and Abkhazia continues to undermine national security and territorial integrity leaving Georgian authorities vulnerable to their neighbour’s potential attempts of changing the status quo. Another result of the conflict is the question of IDPs, constituting approximately 6.5 per cent of the entire Georgian population, which continues to be challenging in terms of, for instance, provision of appropriate infrastructure and the state’s long-term development. And at the same time, the need to reckon with the interests of other external actors, such as the USA, Turkey, and Iran, further obfuscates domestic and regional security situation. Given these challenges, will it be possible for the country to maintain its earlier dynamism leading it down a path of reforms? The options for Armenia’s foreign policy orientation are considerably more limited, partly due to its being embroiled in a territorial dispute with Azerbaijan over Nagorno-Karabakh and having two out of its four borders closed. For many years, Armenian foreign policy-makers have trod a very fine line between Russia and the EU in an effort to maintain good relations with both. Following a decision not to sign the Association Agreement with the EU in 2013, Armenia became a member of the Russia-led Eurasian Economic Union in 2015. Nevertheless, in 2017 the EU and Armenia negotiated and signed the Comprehensive and Enhanced Partnership Agreement. Despite maintaining good relations with the EU and the fact that recent election of Nikol PASHINYAN as Armenian Prime Minister in the aftermath of the so-called Velvet Revolution in April 2018 distinctly resembled the "coloured revolutions" from the past, the close ties with the Russian Federation, the traditional guarantor of Armenian security, have not been weakened. The 2019 edition of the Baltic Study Trip addressed the issues of regional and wider European security and defence broadly seen: from hard to smart security, identity and borderland politics, energy geopolitics, conventional defence and hybrid deterrence to cyber and information security. The study trip included visits to academic and professional establishments in the four countries: Latvia, Lithuania, Estonia and Finland. This study trip aimed to tackle highly topical issues, and to familiarize students with mainstream academic and political narratives, on European security in times of uncertainty – from general security related problems, the region’s peculiar posture and role in the Euro-Atlantic security policies, soft security matters (national minorities, contested identities, domestic-foreign political dynamics, direct exposure to information and social media warfare of sorts, etc.) to hard security concerns (including the Russia’s ‘traditional’ energy leverages as well as nowadays increasing military build-up in the region’s vicinity and the ‘hybrid warfare’ challenge to the wider Baltic-Nordic area). Energy security matters formed a special focus herein: Baltic states’ energy security and cooperation, their role in the EU’s Energy Union and energy diversification policy as well as in the wider regional energy infrastructure projects will be discussed. The study trip also provided the access to the first-hand expertise on the topics of smart security (e-governance, digital market/union, cyber security, state and societal resilience), a policy priority since the Estonia’s 2017 EU Presidency. Given that the region concerned is essential in elaborating the European Union’s common foreign, security and defence policy, including its Russia policy, the trip also aimed to familiarize students with the problems of the current EU-Russia relationship and the prospects for their future strategic interactionism. Our study trip to the EU institutions took place at a historic moment for Europe – merely one week after (the projected date of) Brexit, a month before the Sibiu Summit, and six weeks before the 2019 European Parliament elections. These events defined the visit’s themes. As we were in Brussels and Luxembourg at a time of important shifts and big picture agendas, so should our visit be “big on big things and small on small”. In Brussels, we will be particularly focusing on security and defense, an area which has seen dramatic increase in terms of EU involvement, with its budget in the next projected Multiannual Financial Framework having multiplied many times over. In addition, we will be discussing the Energy Union and its governance, by looking into the energy transition, the future of EU energy and climate policies; and the EU’s external energy relations in the changing international landscape. During the Luxembourg part of our trip, we plan to organize meetings concerning the ‘digital cases’ being decided in front of the courts.